The plan for the day is to stop at the Adventure Cycling Association office in Missoula, then head to the starting point of the Divide ride, the Whitefish Bike Retreat. By their own advertising, the only bike retreat in Montana. I got up early and headed for Missoula, arriving at the official opening hour of 8:00, it is a soft opening. I grabbed something to eat and came back at 8:45 , and everything was hopping. They didn’t know what to think of the guy in full motorcycle gear in their entry. I explained my setup and people starting coming out of the woodwork to check it out. I got a personal tour by one of the cartographers, Jen, who had just been on a ride with Sid Voss, a former principal at Glen Lake for the kids and now a tour leader for the ACA. Eventually, Greg Siple, one of the founders of Adventure Cycling came to get my story and take my picture for the archive. Who knows, it may show up in the magazine. Anyway, a brief celebrity sighting. They gave me a commemorative banana and wished me a safe journey. I was still about three hours from my destination and I didn’t leave Missoula until after 10:30… trouble. The ride up the Swan Valley was scenic but, with lunch and gas stops, I didn’t reach the Retreat until 3:00. no way I was going to get to Glacier. New plan, catch the shuttle to Glacier with Jim. 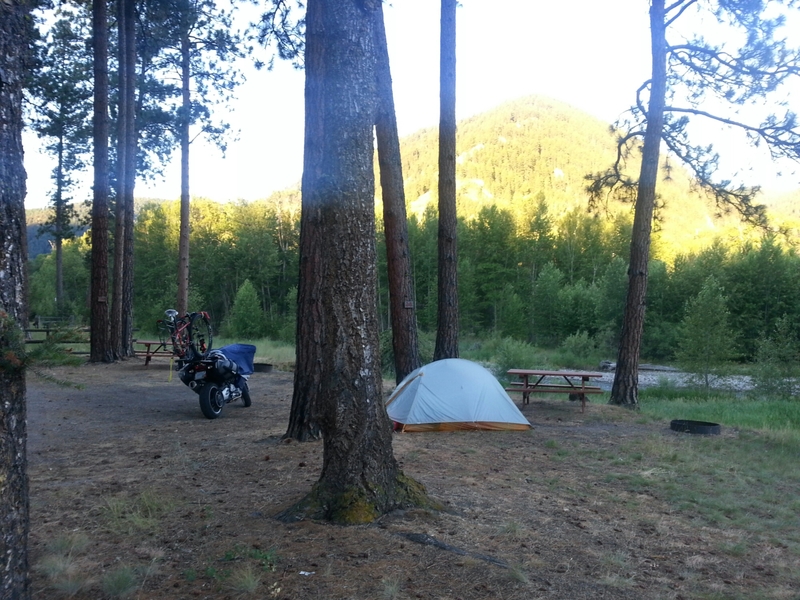 That gave me time to mingle with the staff, repack my stuff, dry out my tent and park my motorcycle. While hanging out, up walks Sid. I caught him a little off guard. He’s leading a tour the whole length of the Divide. What a way to spend the summer. Only photo today is the sunrise at my campsite for last night. Tomorrow, riding up Going to the Sun Road to Logan Pass, and coasting back down. Maybe some pictures worthy of sharing.